Bedford Place community is sold out and is not in active development by builder. If you are interested in Bedford Place or similar new home communities, contact us today! Our agents are very familiar with new and newer construction in Portsmouth, and can identify resale opportunities in Bedford Place, as well as builder inventory available in nearby or similar communities in Portsmouth. To view more pictures, interactive maps and the full, detailed description of the Bedford Place community, please Login. Located in a centralized section of Hampton Roads, this community is ideal for anyone seeking a residence within close proximity to all southeast Virginia offers. Military service members can easily access nearby bases like Naval Medical Center Portsmouth, Norfolk Naval Shipyard and Coast Guard Base Portsmouth. Homebuyers might be surprised to see what properties come with in Bedford Place. 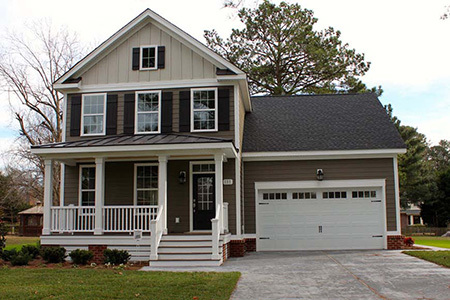 Exterior features may include Carolina beaded vinyl siding, brick skirting, Schlage security deadbolts, insulated vinyl windows, attached garage complete with door opener, landscaping, covered front porch and rear privacy fence. Value can be seen in each of these homes before even walking in the front door. The Virginia Beach metro area real estate market now offers a newer established neighborhood with many extra touches. Interior features of each new construction home here may include granite kitchen countertops, tile backsplash, double stainless steel sink, garbage disposal, Kenmore appliances, programmable thermostat, crown molding, nine-foot ceilings, security system wiring, ceiling fans, brushed nickel finishes, Sherwin Williams paint, laundry room and elongated toilets. Buyers looking for a place of their own are right to consider Portsmouth, VA. This lively bayside city has much to do and see. The Children’s Museum of Virginia is fun for kids of all ages. The Portsmouth Art and Cultural Center provides a place for anyone looking to learn something new or improve upon an artistic skill. Sports fans can check out the Virginia Sports Hall of Fame and Museum. The Hoffler Creek Wildlife Preserve is an ideal spot for residents to catch a glimpse of regional wildlife and take in some scenic views. Established homes in Bedford Place can give Hampton Roads homebuyers a lot of real estate for their buck. Send me more information about communities similar to Bedford Place. Our agents gladly offer FREE property tours of Bedford Place, Portsmouth and homebuyer consultations to all serious buyers. Our Portsmouth SH Pro is prepared to represent you and your interests so you can move into your dream home.